A fun decorating trick if we ever saw one! We came across this bedside table idea via Vosgesparis blog and although there are no instructions on how to hang it, we put together a little how-to here. Since this swing isn't used like a real swing, you don't need to install it for that use (that would be a more major installation). This idea just uses hook screws hanging from a ceiling joist. 1 Rope Tree Swing - you could make one or there's a few we found on Etsy at various price points. Click here for a few we've bookmarked. Step 1: If you know how to install a hook into a ceiling, then just install two, measuring for the swing's ropes, then jump to Step 2. If you're not sure how to do this, here's our take: Look for a stud in the ceiling. You can do this with a stud finder by sliding it over the ceiling to find the joists. Another way is to use a magnet by sliding it on the ceiling you can sometimes locate the screws in the studs that hold the drywall. If your ceiling's texture is too rough making this useless, you can also take a bright flashlight and hold it up parallel to the ceiling where sometimes you can see the small depressions where screws are located that hold the drywall to the joists. Or just knock like I usually do (much to Earl's frowning). Once you find a stud, you can then measure every 16 or 24 inches to find the others. Once you have found the stud you want, measure the distance between where each rope will hang. Mark these with a pencil. 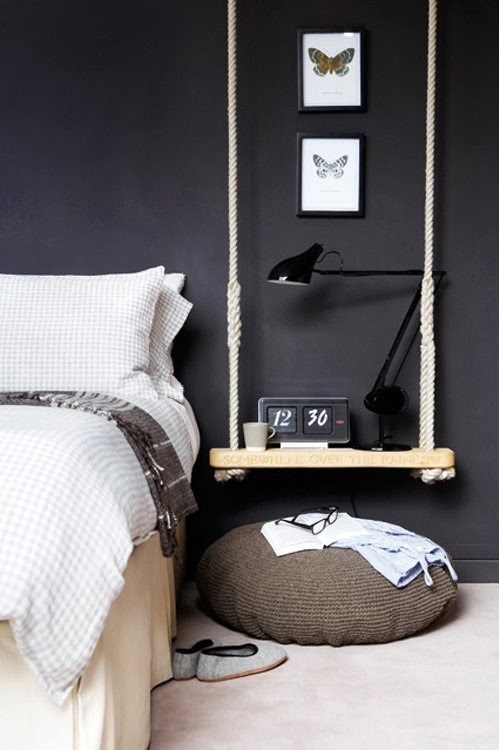 Since this swing is not for swinging (which would entail you going into the attic to secure from there as well), you don't need to install like a real swing . Use an electric drill to drill a hole where you've marked for your hooks into the ceiling joist. This will allow you to screw a hook into the ceiling afterwards by hand. The drill bit should be about the same size (diameter) as the hook's screw's threaded shaft, but smaller than the outer threads. (Note: If the hole is too big, the screw won't be able to grab onto anything). After you have made the hole, gently twist the screw in clockwise. As you turn, it should get harder to screw in. (A pliers might help you twist it in if it's getting too hard to do with your hands). Twist until the base of the hook is flush with the ceiling. Install the other hook as measured. You can also install a hook in a location where there is no joist by using a toggle bolt (or toggle anchor). This type of bolt consists of a bolt threaded through the center of two spring-loaded wings, and instead of a standard bolt head, it has a hook attached to the end. Don't use the plastic kind for things that you're hanging from the ceiling, as it's not strong enough. If you determine the weight of the swing and what will sit on it for this application, you can consult a chart of load capacities to help you pick the correct toggle bolt. Step 2: Hang the swing! The rope for this swing should have two loops on each end from which to hook each onto the hooks you just installed. Then set up your bedside display! Yay! Happy weekend and Happy Thanksgiving to our fellow Canadian readers!